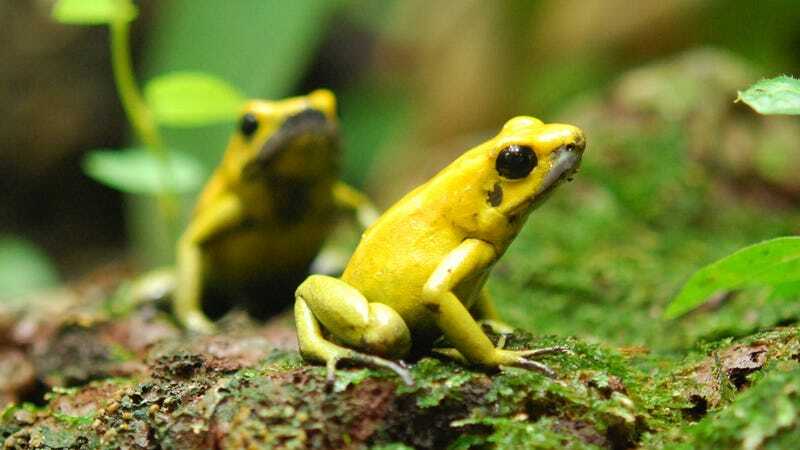 Poison dart frogs have an ominous and well-deserved reputation as a lot of death stuffed into a teeny, neon package, and none is more dangerous than Colombia’s golden poison frog (Phyllobates terribilis). With skin slaked with enough of the potently neurotoxic batrachotoxin (BTX) to kill a staggering 20,000 mice, the golden poison frog somehow doesn’t poison itself. A team of scientists have now pinpointed how the frogs survive their lethal secretions: a single genetic mutation that results in full immunity to BTX. Poison dart frogs eat beetles and other insects that produce powerful toxins (alkaloids), and then concentrate these diet-derived toxins on their skin, granting themselves a formidable defense against predators. The most lethal toxin by far in their chemical weapons arsenal is BTX, an alkaloid found only in a handful of poison dart frogs (and, weirdly, a few birds). BTX works by messing with special gates (called “channels”) on the outer membranes of nerve cells that control the flow of sodium ions in and out of the cell. The toxin comes along and attaches onto these channels, disrupting the ability of the nerves to send signals to muscle fibers. Muscles can’t do what they’re supposed to, diaphragm-driven breathing is halted, and the beating of the heart stalls. Things don’t get better from there. The tetrodotoxin (TTX) found in poisonous pufferfish also kills by shutting down neuron function by interfering with these sodium channels. Considering that pufferfish are immune to their own TTX via a single amino acid mutation in their own sodium channels, could it be that golden poison frogs do something similar to survive deadly concentrations of BTX? Two researchers from State University of New York (SUNY), Sho-Ya Wang and Ging Kuo Wang, decided to investigate the matter by looking at five different, naturally occurring variants of amino acids in the muscles of the frogs—candidates for self-immunity related to subtle changes to how the frogs’ sodium channels functioned. To figure out if any of these amino acids were involved in BTX resistance, the researchers replaced amino acids in the muscles of rats with the frog variants through a molecular genetics switcheroo. By replicating the presence of these mutant amino acids in the rats, the researchers could now test if the BTX resistance came along with it. Sure enough, when the rat’s five amino acid counterparts were replaced with the frog versions, the muscle was immune to effects of BTX. Next, the five variants were narrowed down, one by one, leading to the discovery that a single amino acid variant on the sodium channel was responsible. Dubbed N1584T, it exists as the presence of the amino acid threonine where asparagine should normally be. Remarkably, it is ultimately the result of an alteration at a single base pair position in the gene that codes for the construction of a portion of the frog’s sodium channels, according to the study published recently in the Proceedings of the National Academy of Sciences. There are other amphibians, like salamanders and cane toads, that have demonstrated tetrodotoxin and bufotoxin autoresistance respectively, in a similar fashion to the pufferfish, but nothing in poison dart frogs before this study. The findings are likely applicable to any poison frog that uses BTX (there are two other species). But there are also many other toxins used more readily by poison frogs that cause neurotoxicity in a completely different fashion. It’s worth noting that the golden poison frog is endangered, existing in only an increasingly small stretch of Pacific coastline in Colombia. While this discovery won’t necessarily lead to an antidote for BTX, since resistance comes from an inherent quality of the frog’s own cells, it provides fascinating perspective on the function of important, even lethal, biochemical processes. That perspective stands to be lost if animals like Phyllobates terribilis go extinct.